Ken Clark: I think it fair to say that the long term commitment to your feature length cartoon extravaganza The Thief’ is the subject of much speculation. A short extract was shown on television and was exciting enough for me to ask: How is the project progressing? 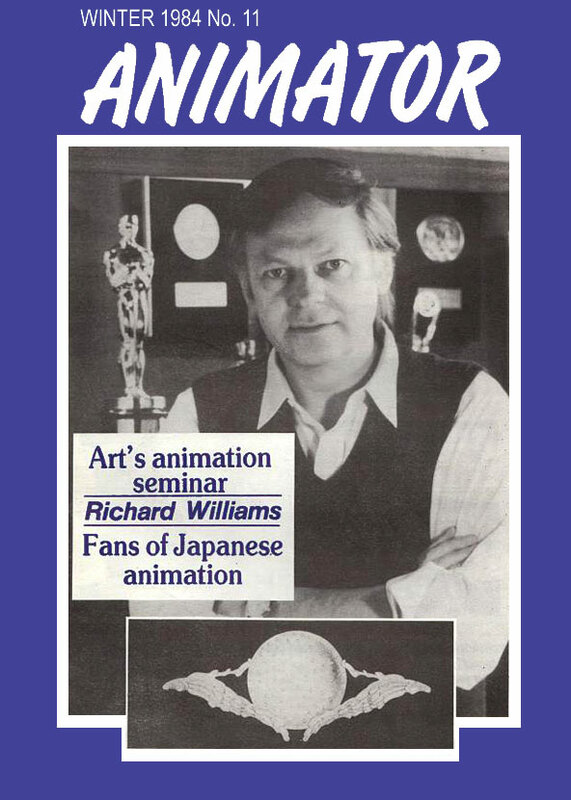 Richard Williams: A great deal of the work on “The Thief” is carried out in the lull’s between commercial work. Instead of reducing the staff we keep them on to do research and development. I wanted to call the film “The Thief” for quite a while but that did not seem good enough. “The Thief Who Never Gave Up” seemed to be a good working title but I’m now having an unhappy ‘fit’ with it. We can’t get the right title – we have no problem with the animation though! K.C. : As you have grown in experience and expertise over the years, I wondered whether you had grown more critical of your earlier work. Are you still happy with the early work? R.W. : Yes I am critical. Years ago we did some finished bits and 1 threw them out because I hated them. We found if we worked in pencil – and, after all, animation is basically pencil and paper. K.C. : I know what you mean. The front cover features a picture or Richard Williams. Click the pic to see a larger version. It was like a flash of light. I thought: “He’s right,” and that is what we have done; although we have now finished 13 minutes of the film which you can see later. It all looks very different in Panavision. K.C. : Thank you. Does it compare in any way with Bluth’s “Secret Of NIMMH”? R.W. : No it doesn’t. Well. you’ll see, it has nothing to do with anything.”Secret Of NIMMH”is an attempt to be Disney, isn’t it? – by ex-Disney people, the younger ones. I have no interest in doing anything like that. Never did! My interest in Disney was only to study the articulation, the movement – how did they make it SO good? K.C. : Tell me about your seminars through the Seventies. R.W. : The main occasion was one month of Art Babbitt when we virtually closed the studio. He taught every morning and we did tests every afternoon. He was directing Hanna Barbera commercials and we thought we’d never see him again. However he took a sabbatical and taught here trying to cram all his knowledge into us. And then we landed him again. About a year and a half after that first session, he left Hanna Barbera and came to work for us and he’s been with us ever since working in our Hollywood studio. He teaches there. Last year he taught the whole year through. He is now writing a book which we are sponsoring. If I can return to “The Thief” for a moment … we picked up scenes which Ken Harris animated 8 – 9 years ago and after we re-timed them to snap it all together, everything tightened up by two-thirds. K.C. : What is the current situation? R.W. : We have one-and-a-half hours of Panavision pencil tests and 95% of the recorded track. We are putting on the music in little bits as we go, but I made some changes in the script about a year and a half age and this meant recording new lines here and there. K.C. : So you need the financial backing to transfer the picture from paper to cel? R.W. : Yes – and finish it! In transferring from paper to cel we really go over everything again so that the style is consistent. Disney’s ‘Old Men’ drew in their own way, so we have to unify the whole thing. It is almost like starting over again, except that you have the armature … the acting.